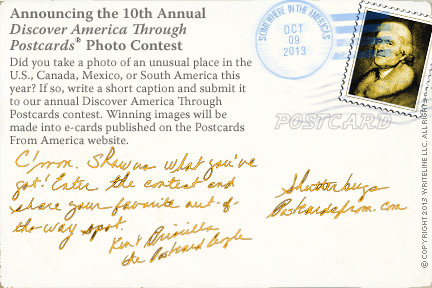 October is "Discover America" month, and so on Oct 14th, Columbus Day, we're officially opening our 10th Annual "Discover America through Postcards" photo contest. The purpose of the contest is to select and showcase four photos of interesting sites in America--North, South or Central America--that will inspire viewers to want to learn more. So, rifle through your photo files and give us your best shot of a special place in the Americas, one that captures the beauty, history or curiosity of the location, something truly inspiring. 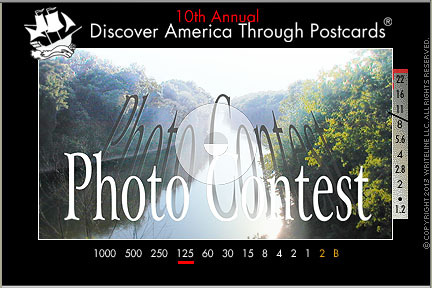 Submit your photo today to our 10th Annual Discover America through Postcards photo contest. See how easy it is. The winner of the $100 Grand Prize will be announced on December 10, 2013, just in time for a little extra holiday shopping. All finalists will receive an autographed copy of the companion book, Discover America Diaries. The grand prize winner receives an autographed copy of the book plus $100.